Oats are a great alternative to breadcrumbs as a stuffing, plus they give it a healthy twist. To make the stuffing, melt the butter in a saucepan set over a low heat. Add the onion and garlic and cook for about 5 minutes, until softened. Stir in the oats, breadcrumbs, lemon zest and chopped herbs. Lightly season the stuffing with salt and pepper and allow to cool completely. Fill the cavity of the chicken with the cold stuffing and tie the legs together with kitchen twine. Place the chicken on a roasting tray. Rub the chicken all over with the softened butter and mustard, then sprinkle over the rosemary and season generously with salt and pepper. Roast the chicken in the oven for about 1½ hours, until the juices run clear when you pierce the thickest part of the thigh. Allow to rest for 10 minutes before carving. 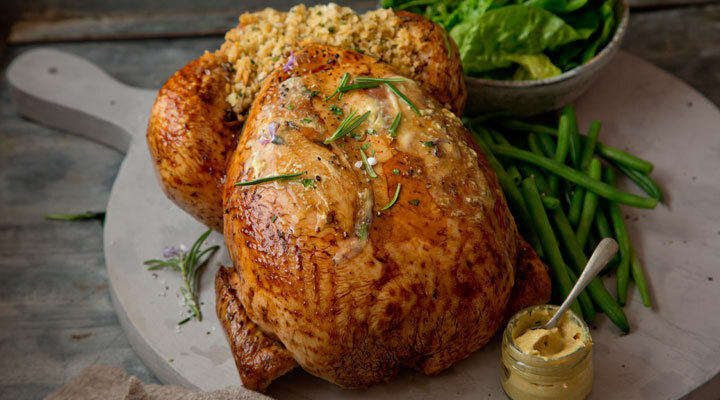 Serve the succulent roast chicken with stuffing on the side, freshly cooked green beans and some lightly dressed baby salad leaves.